King Kuka was a sculptor, a painter, and poet—and in all things, he was uniquely King Kuka. His art, like his life, was informed by his heritage. Blackfeet culture was in his soul. Kqyn is the third of King’s seven children, and one of five to pursue a life in art. Each of the Kukas has taken something from his teachings, and each has stamped the Kuka legacy with his or her original style. The path forward was not always clear to King Kuka. From the time he was a boy (in the 1950s) he had heard two conflicting messages. His grandmother, Far Off Woman, and others at the Indian reservation had taught him to take pride in his tribal culture. Outside, however, he was branded with limitations; people told him what Indians could and could not do. It was a disturbing message. Here he was, a creative youth, and best he could tell, mostly white men were artists. Few Montana artists were Native, and even fewer were prominently known. Still, King forged ahead. As a teen he studied at Santa Fe’s Institute of American Indian Arts. He took courses at the University of Montana and Montana State. After earning his degree, he taught art to junior high and high schoolers, and in time, he achieved his dream; he became a fulltime Indian artist. Marietta met King in 1974, when he was a teacher still developing his professional art career. They were introduced while on a blind date, though not with each other; her friend was paired with King and she with King’s friend. It didn’t take long to realize they were mismatched. Marietta recalls how King impressed her early on by painting her flowers, skillfully and with ease, in a style distinctly his own. King’s impressionistic watercolors impressed many—Southwest Art ran a six-page article on them in June 1982—but what truly set him apart and what he would best be known for were his “Kukagraphs,” an art form that transcended any one medium. Kukagraphs were textured paintings King made with a lithograph press and embossing. The style is one that he developed himself, but the name came from others, and it stuck. Each Kukagraph captures the essence of its subject and is indicative of King’s intense love of Indian culture. “The competition hasn’t caught up to him still,” says Kqyn. Some of Kqyn’s earliest memories are doing art with her father. By second grade she was carving wood and stone. In time, she would become an established metal artist. “You could tell what art the kids did with him,” says Marietta. King helped them mold their interests into real talent. 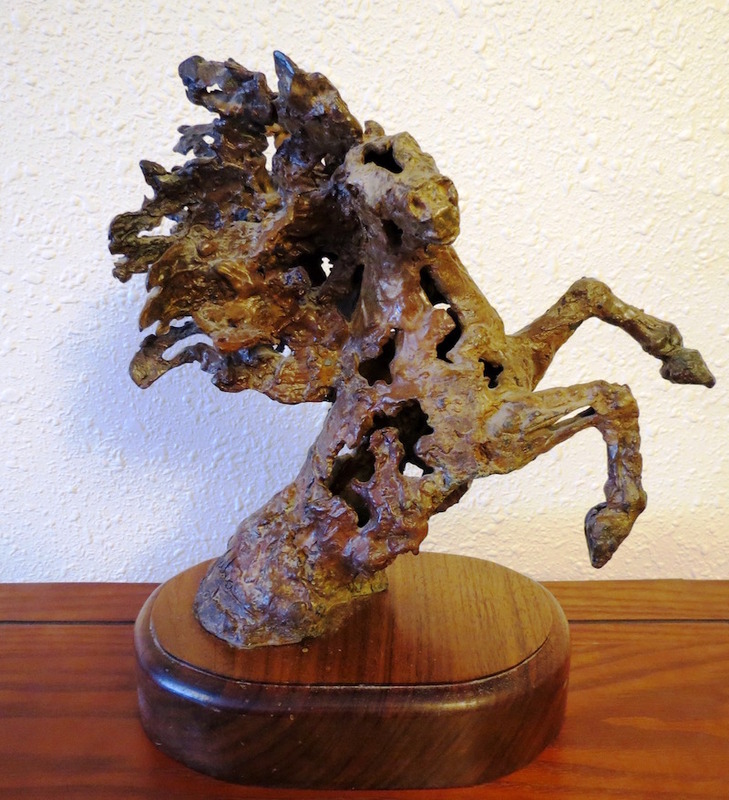 Kqyn (as stated) creates metal sculptures. Kodi designs in prisma color. Khi works in oil, painting on paper and buffalo skulls. Kokko and Khol do oil on paper with embossing, though their styles are distinctly different. Truthfully, King encouraged his children to get “real jobs,” and to do as much art as they desired on the side. He knew how difficult it could be to pay the bills (or even put food on the table) as a young artist, though his children perhaps had some advantages compared to when he was starting out. King and his contemporaries made the path to professional arts more easily navigable for future Native generations. Through his talents and determination, King helped Indian art became not only accepted in Montana, but even beloved. “People ooo and awe at it,” says Kqyn. King Kuka passed away in 2004, but he lives on in the work of his children. King’s works and his children’s can be found in many venues during Western Art Week, including the DG House & King Kuka Exhibit at First Peoples Buffalo Jump in Ulm, March 17.